Kenneth Rijock's Financial Crime Blog: WILL THE NIGERIAN "SUPERCARD" SURVIVE THE COUNTRY'S FRAUDSTERS ? WILL THE NIGERIAN "SUPERCARD" SURVIVE THE COUNTRY'S FRAUDSTERS ? It is the new MasterCard-based Nigerian National Identity Card, a combination of government ID data and electronic payment capability. For lack of a better name, I am calling it the SuperCard, because of its potential to serve the financial needs of a country where 70% of the population is unbanked, but will it result in super-crime in Nigeria ? The result of a joint effort between the Nigerian National Identity Management Commission (NNIMC) and MasterCard, the SuperCard, which is a debit card, can be used for pension and other government payments, posting salaries to the recipient. as well as traditional payments for goods and services. According to the Government of Nigeria, the biometric data is not in the possession of MasterCard, for security purposes. 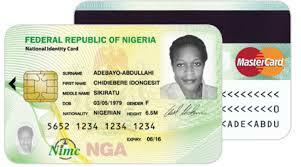 The pilot programme, which will be distributing 13m cards initially, intends to eventually expand to 120m cards. The cards, like any other MasterCard products, will be accepted in 210 countries and territories. The question I pose: in a country made famous worldwide by the 419 scam, how long will it be before Nigeria's multitude of criminal organisations clone and counterfeit the cards, breach security, corrupt the NNIMC, and/or penetrate the payment process ? Though these cards are clearly a blessing, will they spawn a massive financial crime wave heretofore not seen in Nigeria ? If so, transnational criminal organisations will certainly be seeking to draw funds, using the cards, in other countries, which might render them persona non grata outside the country's borders. One sincerely hopes that this initiative succeeds, but to do so, it will require a team to identify, early on, any vulnerabilities in the card programme, fix them, and to protect the users. We shall see whether such a crime suppression unit will be created, and be effective.